When you have to leave your pets, let them vacation with us at Oviedo Animal Hospital! Our staff provides personal attention to each pet with several walks daily. Supervised outdoor walks in our fenced yard allows them fresh air and sunshine along with encouraging words. We treat them as if they are members of our own family. We provide high quality Eukanuba food for our boarding guests. However, if you would rather not change your pet's diet while you are gone, feel free to bring their regular food and treats and we will be glad to feed him his/her regular diet, at no additional charge. Pet can be dropped off and picked up during normal business hours, Monday through Saturday. We do ask that you drop them off at least 30 minutes prior to closing time so that we can walk them, put food and water in with them and get them settled and tucked into bed before we leave for the night. As you can see in the photo, each guest has all special instructions attached to the front of their area. 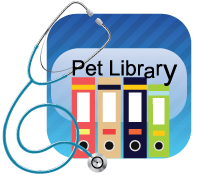 If they need medications, special diet, play time, extra walks, bath, or nail trim (nominal additional charge), it is all noted on their instruction sheet. Our kennel was completely remodeled in January, 2008. We have beautiful, easy to clean, stainless steel doors along with raised floors to keep your pet clean, dry, and comfortable while boarding with us. They never have to lay on concrete. We don't think we would like to do that so we don't think our furry friends would like it either. We know that a familiar blanket or toy might make your pet feel more at home; you are welcome to bring them. While we don't guarantee safe return of all articles, we certainly try our best! If they are soiled while your pet is boarding, we will put it in a bag for return to you. All pets must be current on vaccinations and have a current application of flea and tick preventive in order to board with us. This is for the protection of all our guests. During holiday and high boarding periods, we reserve the right to only accept boarding reservations for pets who get their annual wellness exam and routine vaccinations at Oviedo Animal Hospital. Cats and dogs are kept in separate areas, so as not to stress the cats! The Cat Condos have been a big hit with our feline friends. They look out on the waiting room and get lots of attention from all the daily visitors to the hospital. 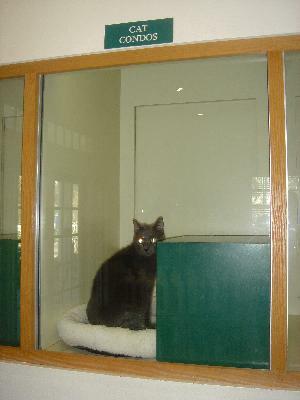 In addition to the condos, we have regular cat kennels, which are slightly less in cost than the condos.